Water Colors Post QEnergySpa, BEFE Sessions - Q the Experience, Future Life Science. The colouration and precipitation of the water after every session is primarily due to a combination of the degradation of the rings within the Orb (water module) and the impurities present in the water source. However, if these were the only two factors affecting colouration and these factors remained constant, one would expect the same colouration outcomes after every session. This is not the case. There are a number of other factors that also play a role. Container usedPlease Note: Session without any person in it may also cause discolouration and precipitation in the water. In the industrialized world of today, “living” energetically charged water is a rarity. In our drinking water supply systems, water is exposed to the detrimental energetic effects of straight unnatural water pipes, high mains pressures and chemical treatments. Water is not allowed to move in its naturally winding way thereby causing loss of life force. Negative energetic imprints from chemicals, such as fertilizers, pesticides and sterilizers remain in the water, even after physical removal of such substance. Under ideal water conditions no discolouration and precipitation occurs. Note that water sources are ever changing. For example: the conductivity and atmospheric electrical activity alter during certain times of the year and may fluctuate during periods of rain. Tap water (treated) – Generally has good conductivity and is readily available. Discolouration and precipitation depends on the treatment by your local water treatment plant and other local environmental factors. Bore or ground water – Generally very conductive, may require diluting by adding either tank or distilled water. Different sources of bore water affect the colours and precipitation differently. Environmental factors play a large role. 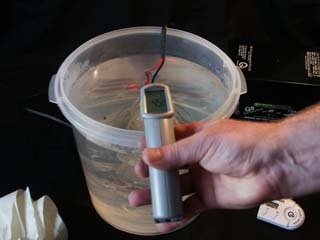 Tank or distilled water – Generally very little conductivity. Often requires a small amount of ‘Conductive Agent’ in order for the unit to operate (the only instance that anything should be added to the water). During session, some of the minerals, chemicals and other impurities suspended in the water, along with the degradation of the rings, congeal to form large molecules, evident in more precipitation and discolouration. Under normal circumstances no ‘Conductive Agent’ is required in order for the QEnergySpa to operate. In the rare event that the conductivity of the water is too low, a ‘Conductive Agent’ may be added. Adding ‘Conductive Agent’ results in increased precipitation and colouration. Rock salt (e.g. Himalayan) or sea salt are the only two current ‘Conductive Agents’ we recommend. At the rate of ¼ – ½ tea spoon per 3 gallons of water (1g per gallon). We all have unique bio-energy fields or signatures (which is constantly changing due to various exposures) much like finger prints. Even identical twins with seemingly the same health status have different bio-energetic fields. These different bio-energy fields interact differently with the water, resulting in diverse colours and solids. One of the most common misconceptions is that people using these devices are detoxifying through the soles of their feet and that the resulting colour is a direct clinical interpretation indicative of specific ailments. This is a medical ‘Detox hoax’. No interpretation or diagnosis should ever be applied to any colour and or precipitation. A visual inspection of the water in the first few minutes during session, will clearly show the precipitation arising from the ORB and NOT from around your feet. Detoxification takes place through the body’s natural channels and is but one aspect of regaining better health. The QEnergySpa is capable of much more. A test of 13 people was conducted using the same water on the same day resulting in different colours and sediments. The lightest water colour (top left of picture) came from the heaviest smoker in the room, clearly showing that no interpretation can be applied to the water colour and the toxins are not drawn out of the soles of the feet. Changing the temperature, changes the conductivity of the water. It also affects the lattice structure of the water. 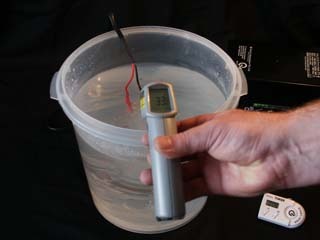 The temperature of the water helps determine the release rate of toxins from the water. Hot water will release solids at a faster rate than cold water, provided there are materials in the water which can be released. Even though heating the water damages the lattice structure, the critical temperature for the ‘damage’ to occur is 87.1 degrees Celsius, which is well inside the critical temperature for sessions. As a result of the vast misinformation from competitive products in the marketplace regarding water colour and detoxification, Q the Experience conducted an experiment with an earlier model power supply and Array to demonstrate the differences that can be achieved by changing water temperature. Two trials were conducted using 33 and 45 degrees Celsius water. In this experiment water temperature was the only variable, all other factors remained constant. Note: this water was treated by itself, no human contact was made during the session. The first test using ordinary reticulated tap water temperatures at 33ºC. The second test using ordinary reticulated tap water temperatures at 45ºC. Picture 1a: Prior to beginning. Note the number of lights on the power supply in the background. Picture 1b: Prior to beginning. Notice that the colour and the amount of sedimentation is already more than that shown in Picture 2a. Notice that the sediment on top and the colour of the water are darker. Picture 4a: After 35 Minutes Picture 4b: After 35 Minutes. Slightly darker again. The above images show that a small increase in temperature from 33ºC to 45ºC will increase the sedimentation and discolouration of the water considerably. This is proof that “Temperature” does in fact impact the outcome in the water. Water itself is not only very sensitive to the weather but also the entire environment. The electrical activity including the conductivity can fluctuate during extreme weather conditions. Proximity to natural and man-made exposures including (but not limited to) geological formations, mineral deposits, chemicals/toxins, electrical influences such as power lines, microwaves, electrical storms, solar flares, lunar cycle, radio frequencies and radiations present in the immediate environment at the time of session will influence water discolouration and precipitation. The graph on the left indicates the electrical activity of water recorded over a twelve (12) hour period. As you can see it is not static, but is in fact very active. Water is completely interactive with the environment. With every use, the rings encased within the Orb degrade. The extent of degradation or corrosion into the water is determined by such factors as the water source and the presence of conductive agent. The components, as well as the type of power supply used for this technology, although minimal, will affect the colouration and precipitation of the water after session. For example, switch-mode power supplies found in other brands are less suited for bio-energetic use, creating considerably higher levels of precipitation and colouration. The QEnergySpa utilises a transformer based technology which is designed and manufactured to specific safety and Quantum Reality Field Science (QRFS) standards. 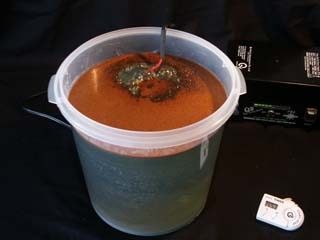 The energetic properties or signature of the bath container also impacts on the colouration and precipitation of the water. We recommend you use a (in order of preference) pure quartz crystal bowl, a raw untreated copper bowl, glass, ceramic or plastic bowl (for ease of use, a disposable plastic bag or liner may be used). You can also use your bath tub. The only stipulation is that the bowl cannot be made of or contain Aluminium or uncoated fibre glass. Size and shape matters little, as long as the orb is fully submerged and you can fit a part of your body in the water. Note: Water Colour from any session, with any device of this technology, may vary due to a large number of different parameters and circumstances, some of which are outlined are outlined herein. No Interpretation should ever be applied to any one colour and/or precipitation, No matter the configuration or system used. Nor should it be indicative of the effectiveness of the QEnergySpa session. Disclaimer: Please note that the QEnergySpa is not offered, nor intended to diagnose, cure, mitigate, prevent or treat any disease or health condition and is not a medical device. Use only as directed and consult your primary health care provider if you have any medical concerns and/or if symptoms persists.